The Shepherd Light Duty Ball Bearing Casters measure 1-5/8 inches and feature a double race rubber wheel-stem. 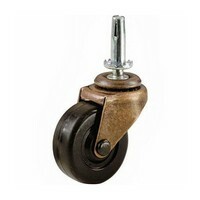 These casters are the industry standard for wood base office furniture. Double bearing raceways allow for instant swiveling and black soft rubber wheels provide smooth, silent operation on hard wood floors and chair mats.